David: Our work on words has made me think about words. Missing words. I miss hearing people asking for a mug of splosh or a cup of splosh. It is a good London word for tea. Most London argot, like the city is never passive and splosh is full of action. The doing of making and pouring tea. It is a word disappearing from the everday, but still there in pockets – Kilburn and Waterloo – and it is passed down in families. A verbal line of transmission. 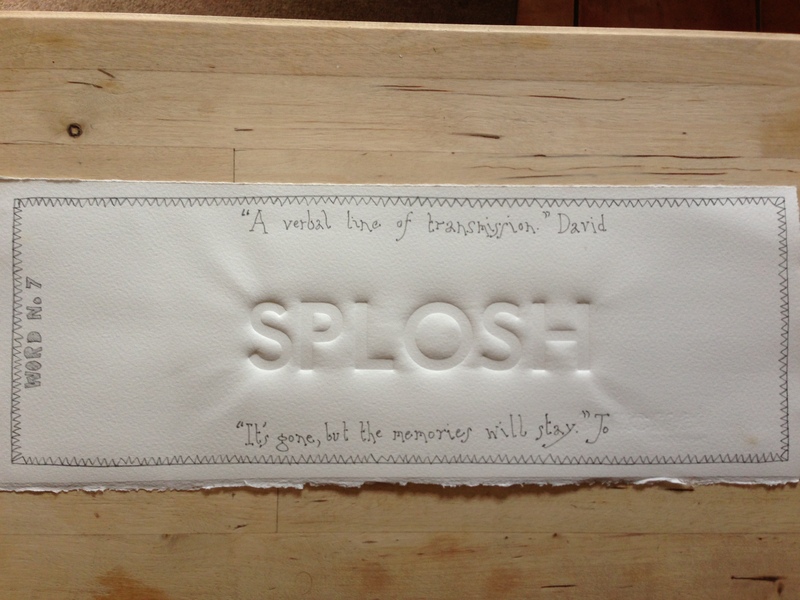 Jo: Um splosh, to me it’s a child like word – never heard in referred to in relation to tea. My dad came from Wood Green and it obviously never made it that far north. Saying the word takes me back to bath time when my lads were toddlers and all that playing that goes on in the bath with water and toys. In fact, how odd is this?! At the moment we are having a big sort out of stuff, you could say we are downsizing in stuff. Only this afternoon Mr R held up an item – “ What is this for?” Held aloft was a large wire basket, this used to sit at the end of the bath holding all the toys that were used to make that splosh sound. It’s gone, but the memories will stay.